This bright and well appointed one bedroom unit in the Palmyra building in the Mountain Village Core is everywhere you want to be. 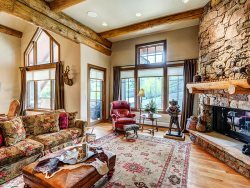 Within moments of walking out of your front door you can be on the slopes, at one of the Mountain Village�s many eateries, or on the free Gondola to downtown Telluride. Ample windows offer views of the Village Core Pond and Palmyra Peak, and high end finishes such as stone floors, flat screen televisions, a king sized Tempurpedic bed, and a steam shower grace this condo. A basic full kitchen and day bed with trundle offer additional conveniences that are sure to make your stay comfortable. Other features include a lobby level ski locker, one heated garage parking space, and an elevator that makes coming and going a breeze.